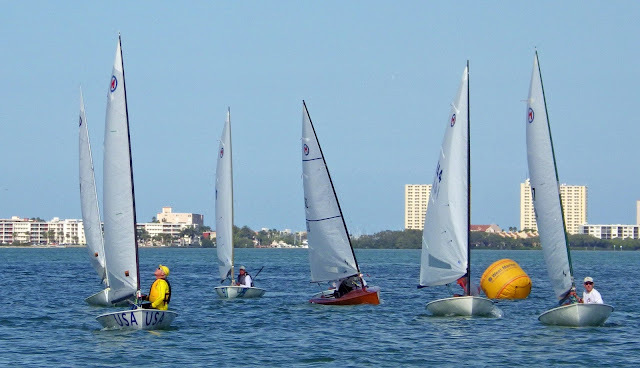 A photo from one of the races of the 12 sq. meter Sharpie class in the 1956 Olympics. Rolly Tasker and John Scott are the left-most Sharpie. I periodically check the Google Stats on this blog for search keywords that Net denizens are using to get directed to Earwigoagin. Two days ago these odd search keywords popped up, "Steve Toschi International 14 sailboat." Steve had his own sail loft in San Francisco at that time, Leading Edge Sails, and the team was always blazing fast in any breeze (as all of the San Francisco 14'ers were, living and sailing and surviving in the big breeze of San Francisco Bay). I ended up having my best two competitive years in the International 14's when I had the good fortune to race on Steve Toschi's ex-POW winner, Stradivarius, once it got sold into the east coast. I figured, given the chance that, down the road, some other person would sit down and type the Google search words "Steve Toschi International 14 sailboat" I should dig into my archives and provide some content that would match the keywords. I found two photos. 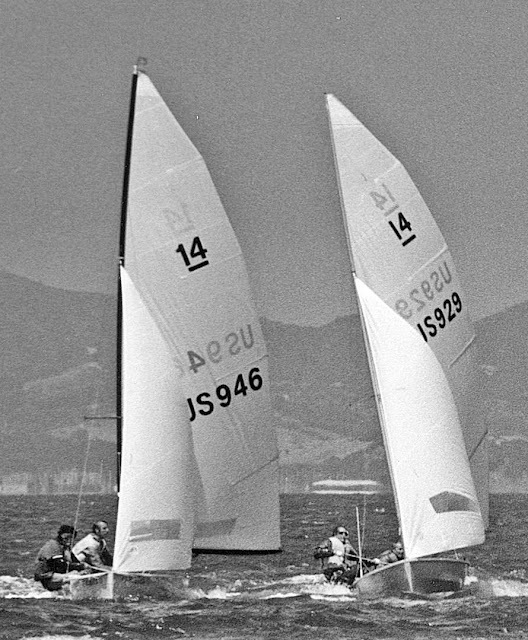 I think this is the 1973 U.S. Nationals in San Francisco Bay. Steve and Dave are in US 946 which is a Sailnetics Kirby IV. Steve raising the main at the dock. This looks like the same KIV. 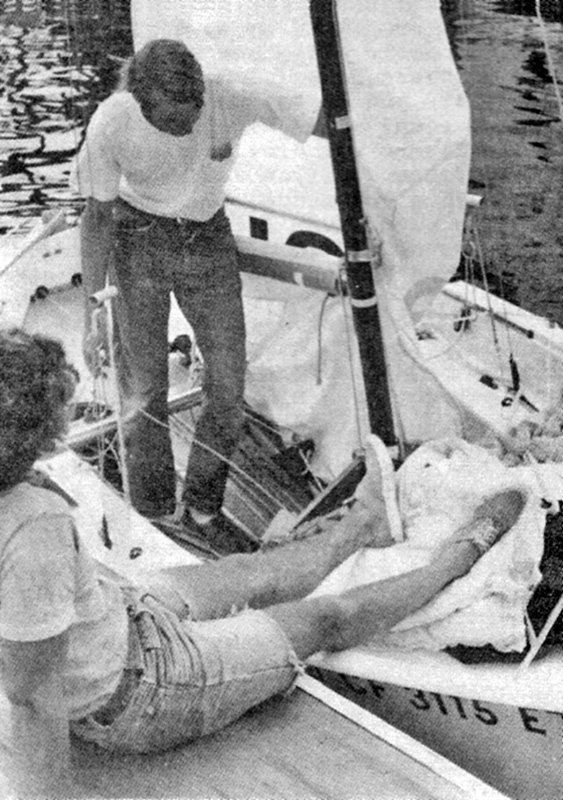 Later on Steve would design and build two 14's, his first design, Home Brew, a three planker plywood design that was ingeniously engineered to take the fiberglass interior of the Sailnetics KIV. Notice that T-shirts and jeans were considered perfectly acceptable as sailing kit in the 1970's - most of us favoring the cut-off jean shorts that Dave is sporting in this photo (and now, 40 years on, these jeans contributed to our generation keeping a legion of dermatologists busy today). 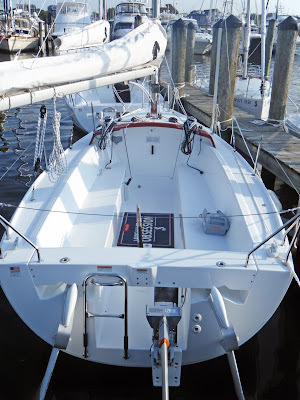 I've posted before on the Bahamian C-Class catboats; the ones that have two crews on pries and a sail with an enormous foot length. Now we can finally add a well done drone video to the conversation. I put this post up and then came across another video of the C-Class Catboats from the same videographer, Dallas Knowles. Here he has a GoPro on the end of the long boom in what seems to be a one-legged race, a beat to windward. Our intrepid C-Class catboat crew first bangs the right side of the weather leg and then half-way up the beat decides to bang the left side. You'll have to watch most of this 14 minute video to see if these not-so-conservative tactics work out. W.P. Stephens started out as a canoe builder and designer but by 1883 became canoe and sailing editor at Forest and Stream magazine. With that editorial bully pulpit of Forest and Stream, the premier sporting magazine of the day, W.P. Stephens found himself placed at the epicenter of the beginning of American recreational sailing. Forest and Stream, under W.P. 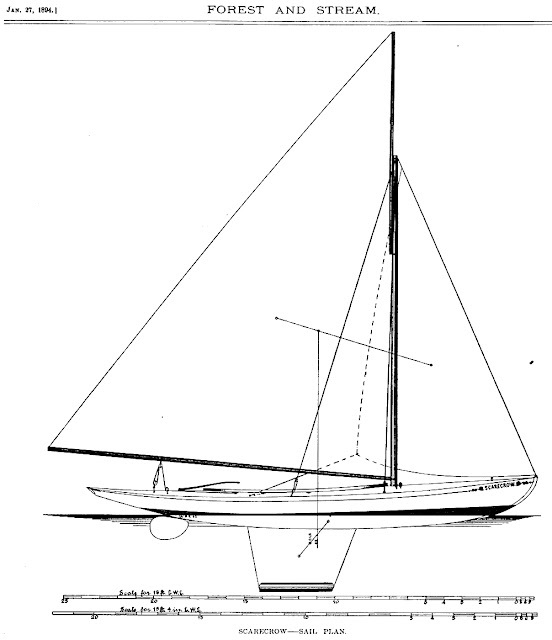 Stephens, didn't hesitate to publish and review all sorts of sailing designs, but W.P. Stephens himself was an aesthete who saw yachting beauty in the narrow shapes and swoopy sheers of the sailing canoe and the English cutter and not the boxy chined shapes of the American sharpie or scow, or the vertical stemmed, no overhang, pinched shapes of the sandbaggers. In 1892, W.P. 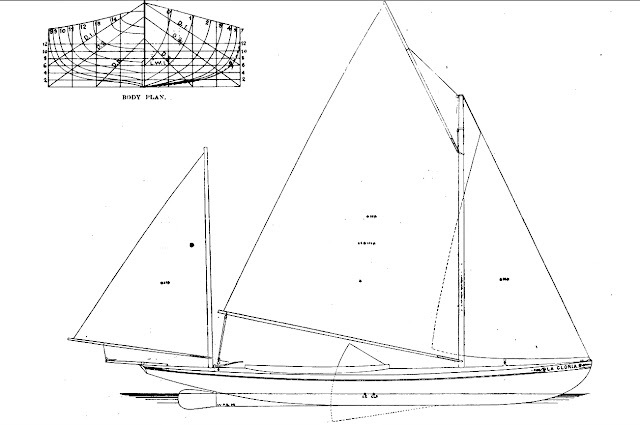 Stephens published two of his small boat designs in Forest and Stream and shows where Stephens thought, in the early 1890's, the future of small boat sailing should be headed. One is a centerboard daysailor/cruiser based on the sailing canoe, La Gloria, and the other one was a fin-keeled daysailor/cruiser, Scarecrow, that is an interesting hybrid of different design philosophies (a flat sectioned shape married to a long counter stern being one). La Gloria was a canoe inspired cruiser designed in 1892 by W.P. Stephens and shows the effort to move the sailing canoe towards a larger, less athletic centerboard sailboat that could comfortably carry more than one sailor. W.P. Stephens writes that it was based off his Delta design of 1886 with the intention in La Gloria to "produce a handsomer and more stylish boat, and to realize such advantage as may be had through a moderate overhang forward, the stern being carried out to give a graceful finish, with some added power." This is certainly a more yachty looking centerboarder then the sailing canoes of the late 1880's. W.P. Stephens offered up La Gloria in two sizes: a 15' 4" LWL model with 4' 6" beam, and a larger 18' LWL model with 5' beam. 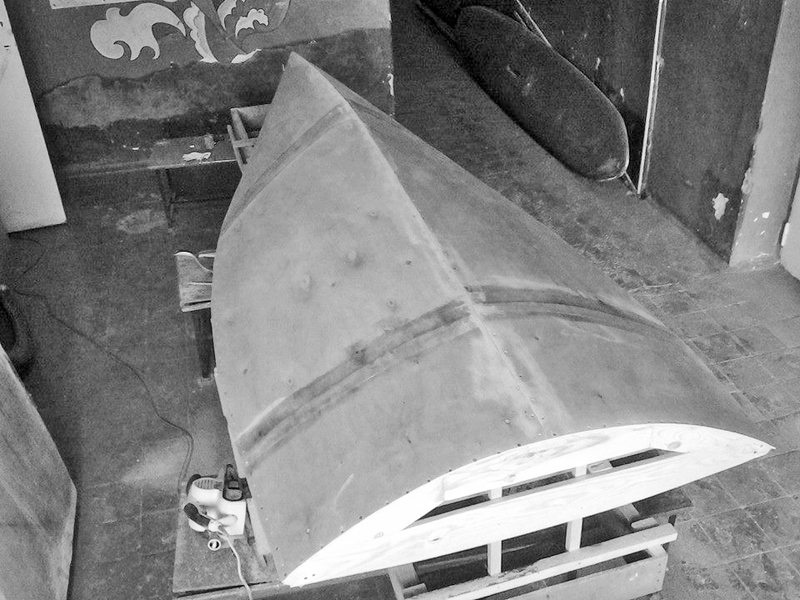 The body sections show flat canoe-like sections with a slight reverse at the keel-line. 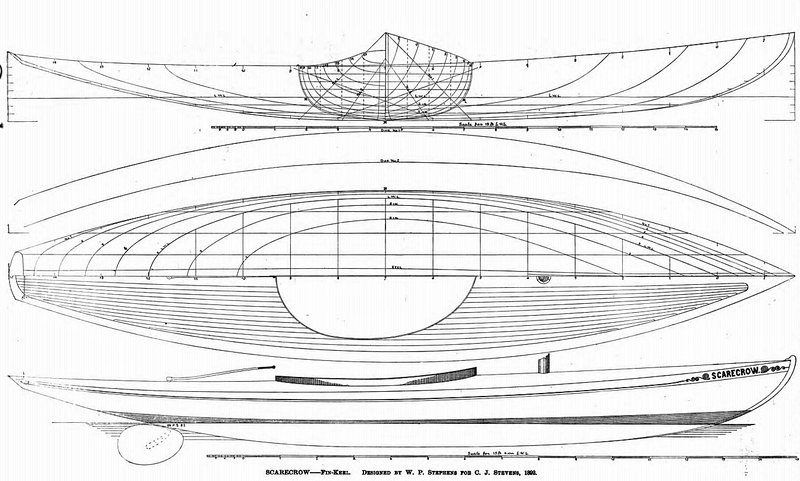 "Whatever disadvantages may be justly laid to the score of modern yachts and small craft with long, ends, this much must be said in their favor, that they are easy models to build, the beam is moderate, the whole form is full and fair, without the humps and hollows of the old fine-bowed craft with full quarters [ed. note: Stephens is referring here to the sandbagger]." 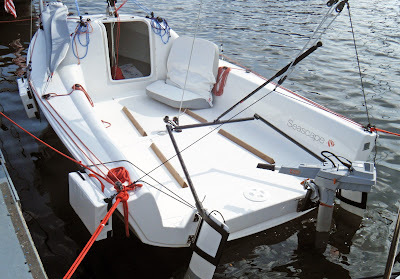 The closest modern sailboat we have to the Scarecrow (at least when comparing the shorter waterline length model and ignoring the rig) is the Scandanavian Cruiser 20. An ad for La Gloria built by the St. Lawrence River Skiff, Canoe, and Steam Launch Company. If you can find a copy, Dan Miller has a great article on W.P. 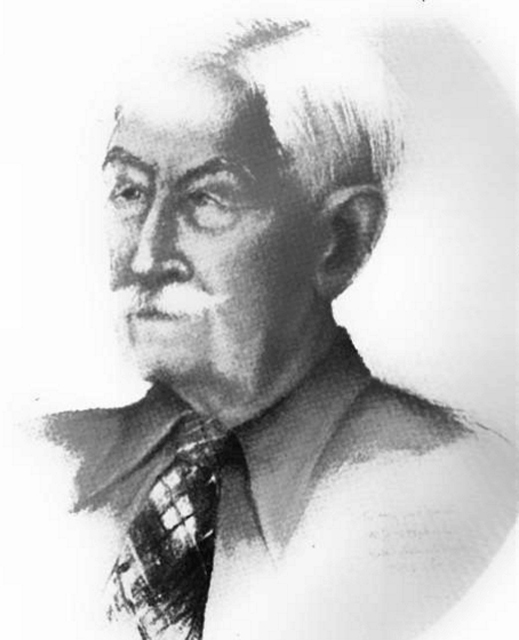 Stephens and his influence on the history of canoe sailing in the Wooden Canoe magazine, Volume 35, No. 4, August 2012. 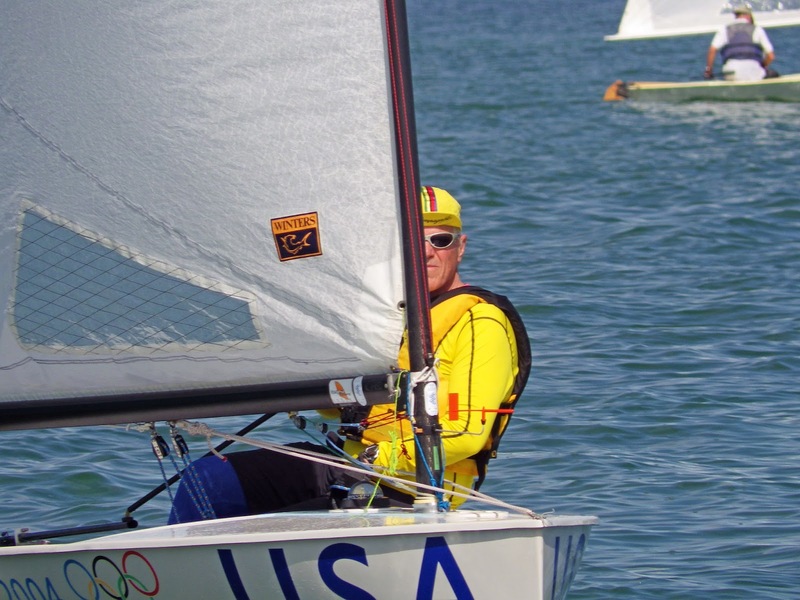 I've been featuring lots of videos about how to do it wrong - time to get back to the Olympic sailors doing it right - in this case Finn sailor Alejandro Foglia of Uruguay. You know it's really honking when a Finn sailor isn't pumping the main. The Finn is a heavy singlehander - 107 kg hull weight - but despite the weight this if full on, balls-to-the-wall reaching. Tillerman over at Propercourse just recently featured a video of the massive American centerboard design Flying Scot planing. (There is a true sense of unleashed power when you get some of these heavy designs up and going; I have some fond memories of some great reaches on a American Lightning dinghy (318 kg.) under spinnaker and also the Y-Flyer scow (227 kg.). Springtime and let's see what the makers in the Classic Moth world are cooking up. 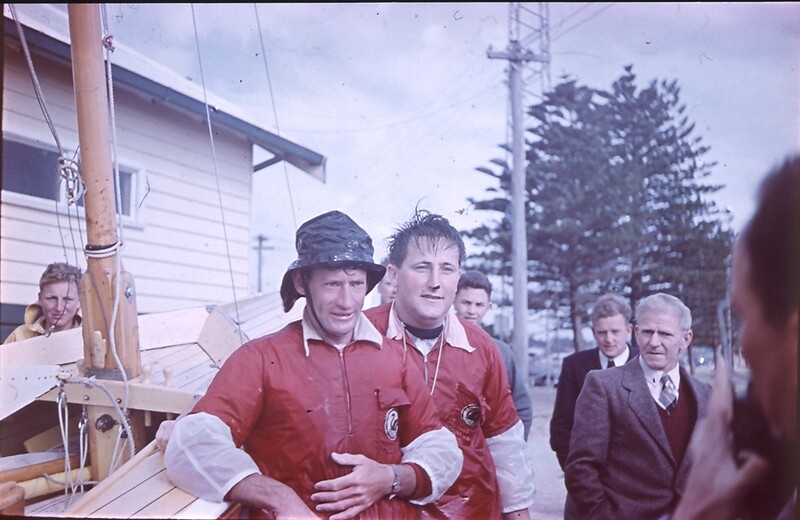 I know two Bill's who are boat-builders and both of them are very, very quick at knocking a boat out from scratch. 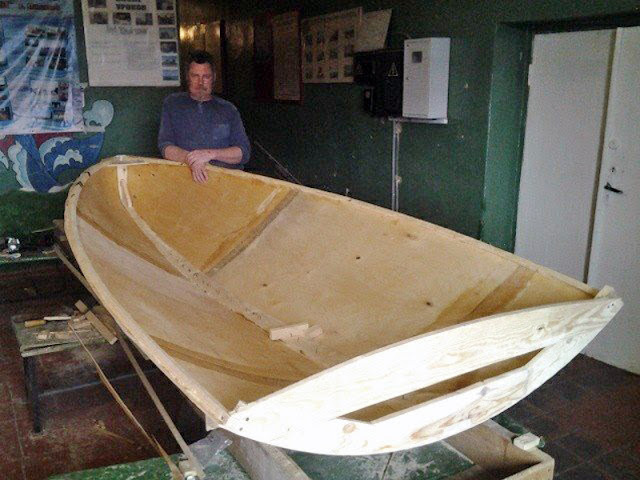 The next couple of photos are from Bill Boyle's blog where he is documenting his cedar strip Europe Dinghy build. 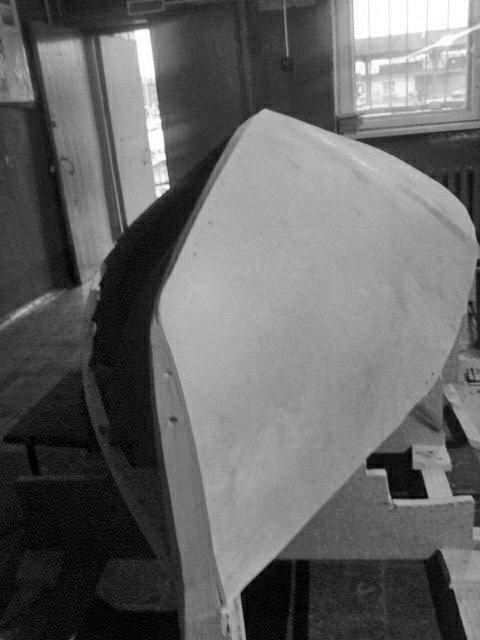 He has the hull off the molds and is now fitting the bulkheads and deck reinforcements. The king-plank for the foredeck and the mast strut connecting down to the hull. This will support the deck-stepped mast. How the mast strut is gussetted at both juncture points. 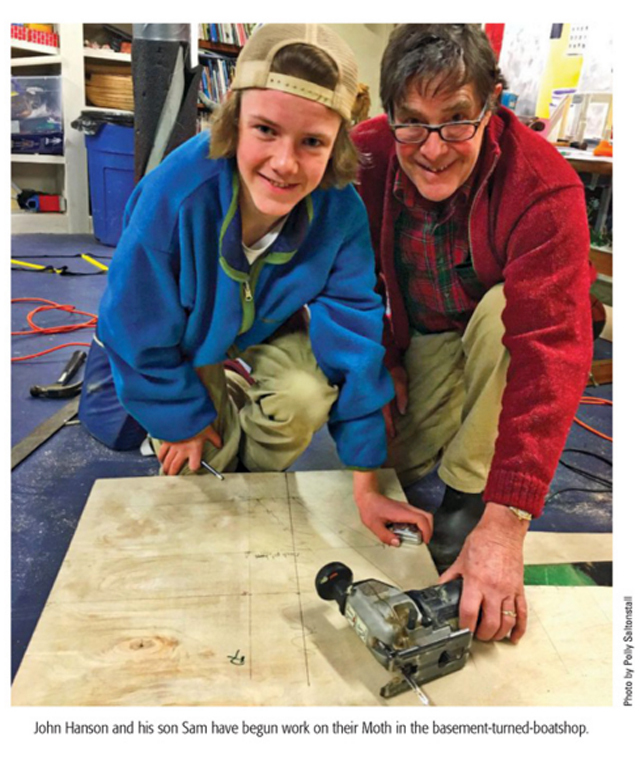 John Hanson, a Mainer, is starting a New Zealand Moth scow as a father/son project. John is the publisher of Maine Boats, Homes, and Harbors magazine and will be documenting the build in upcoming issues. He did a mock-up of the hull (which is essentially a Len Morris MkII scow) in luan. Also, about 50 km. 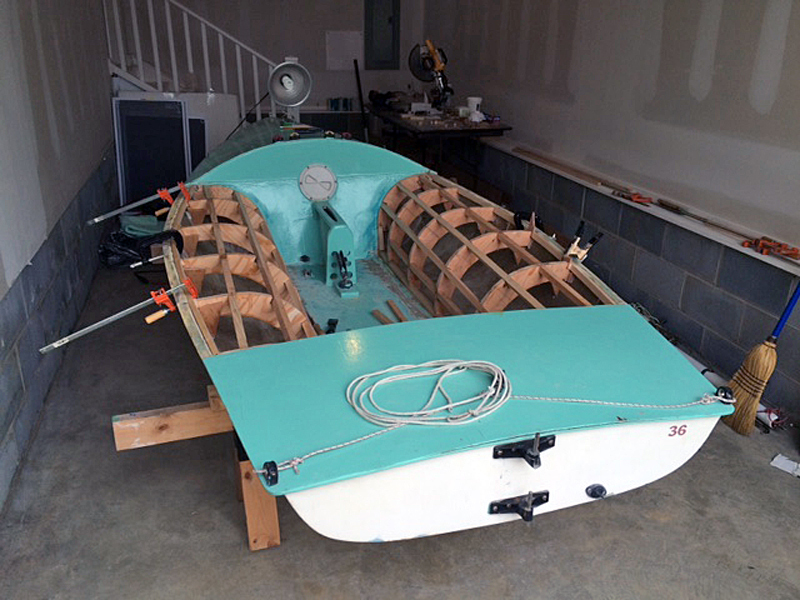 from where I live, Victor Stango is reconstructing the rolled deck on a Maser he picked up over the winter. Whoo! Hoo! another Maser in the local fleet. 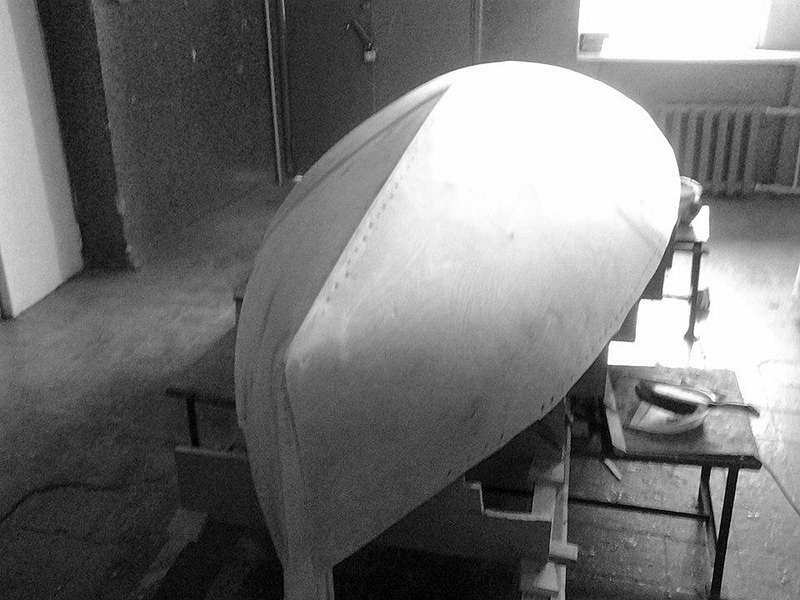 Meanwhile our Classic Moth friends in Russia are proceeding apace with their construction of the Mistral Moth. 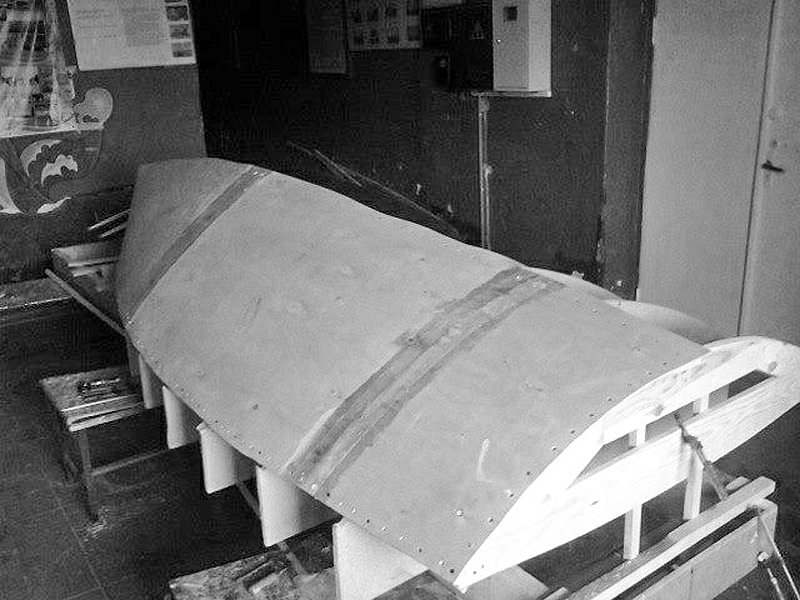 They built the hull over full molds and report that there was little issue in getting the plywood to behave when fitting. Here is one side of the plywood going on. Completed shell off the molds. The builder is Serg-IF. Looking good! Music Whenever: Nina Kinert "The Story Goes"
Fridays were reserved for my music video in the olden days of this blog . No more. This one just randomly happens to fall on the old weekday for music. The previous header photo was of 2015 Classic Moth Midwinters champ, Mark Saunders, running downwind in his Mistral. This makes a nice lead-in to a quick report of the 2016 Classic Moth Midwinters this past February. The Midwinters, hosted as usual by Gulfport Y.C. in St. Petersburg, Florida, was sailed in lightish airs for the most part, and past multiple National Champ, Jeff Linton returned after a layoff to take the title; though both Mark Saunders and Ethan Bixby pushed Jeff hard on Saturday. Frickie Martschink won in Gen 1 in a fleet that comprised mostly of Europe Dinghies. 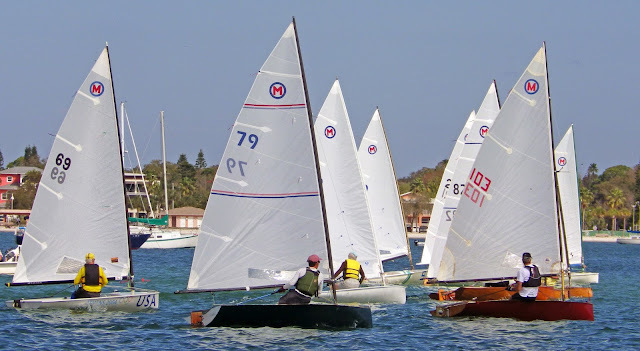 The Charleston South Carolina Classic Moth fleet traveled en-masse to the regatta, having recently restocked with several Europe Dinghies they obtained in a fire sale from the Sag Harbor Dinghy fleet. A trio of Gen I Moths making their way upwind. From left to right; Jack Clark in no. 82 a beautiful wooden Lindenberg, Frickie Martschink in no. 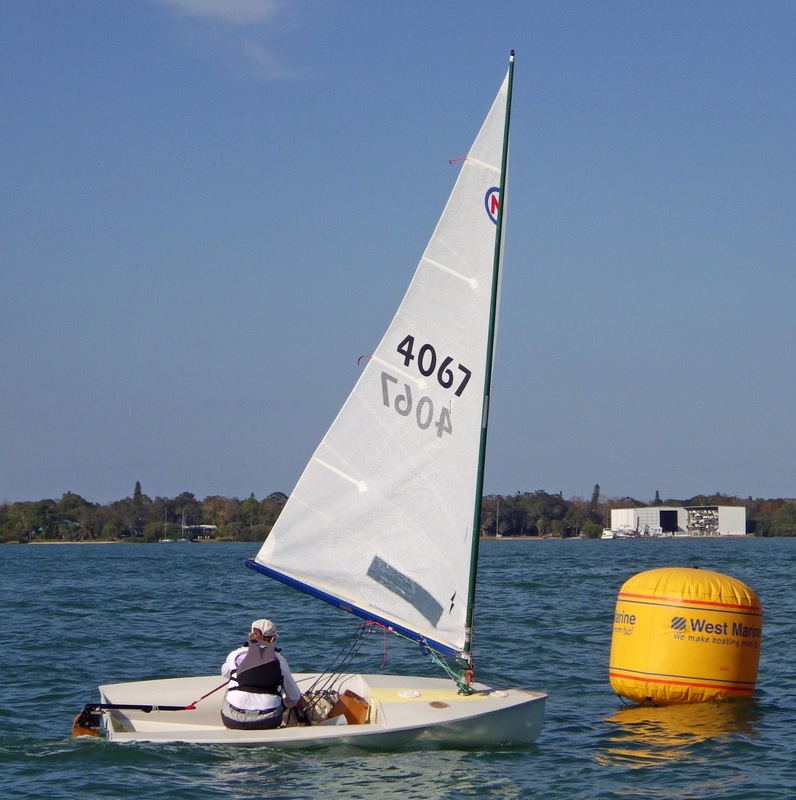 4067, a stock Europe Dinghy and no. 144, Lewis Hay in another Europe Dinghy. Most of the Gen 1 fleet with their skippers folded inside their boats as they slowly make their way around the leeward mark. George A. creator of the Mid-Atlantic Musings blog in the lead. George A. again, sporting his signature "cycling" cap. Mark Saunders finished a close 3rd in the Gen II division with his Mistral. Gen 1 winner, Frickie Martschink approaching the reaching mark. A start on Saturday. North Sails small boat guru, Ethan Bixby borrowed no. 103, a Mousetrap Mistral, to finish second. Just to windward is Mike Parsons in his Mistral who finished fourth in the Gen II class. A panoramic shot of the same Saturday start. George Albaugh has a comprehensive report on the Midwinters, with more photos, over at his blog. 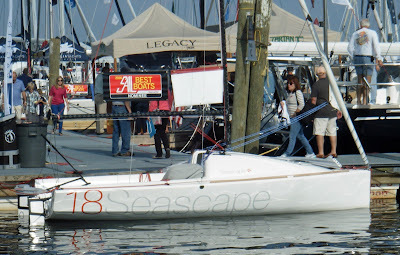 I've been milking the Annapolis Sailboat Show for several posts (it was, after all, only 4 months ago), but it is time to wrap it up with a post featuring a few of the other boats that captured my eye. 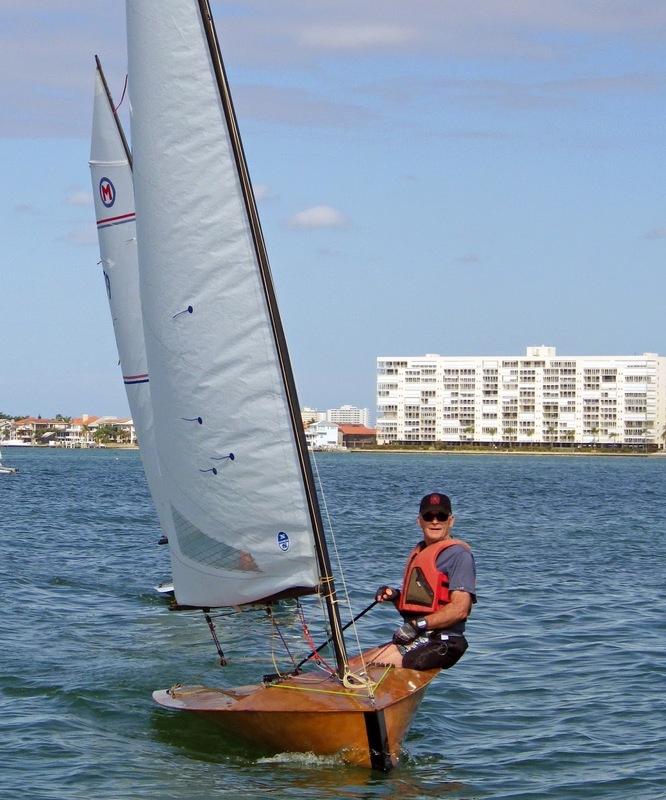 Sailboat manufacturers are designing or redesigning some of their product line so they can be marketed for sail-training or community sailing groups. Beneteau has reworked their Beneteau 22 for American Sailing Association as a sail-trainer (so it sports an ASA designation). A very long cockpit for big groups, double rudder for positive control, a dutchman sytstem for holding the mainsail, roller furling jib; all make for a simpler boat. 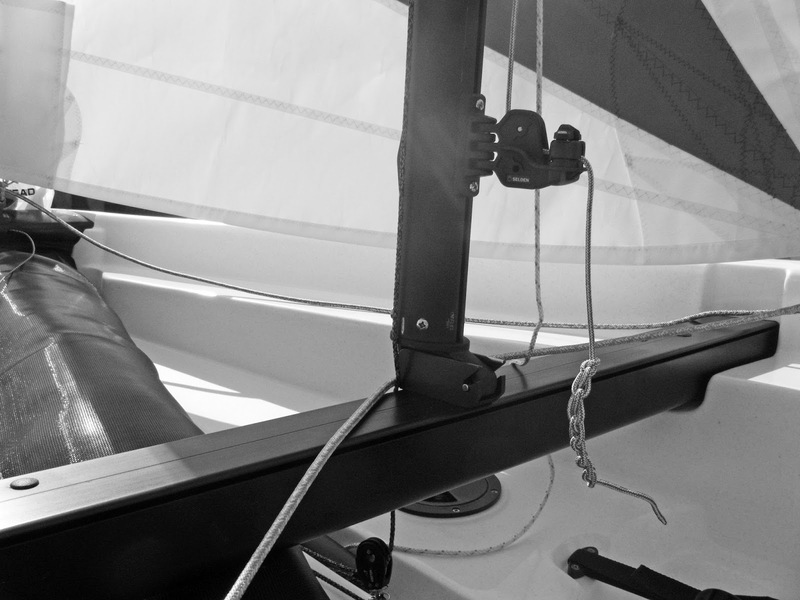 Click here for more information on the Beneteau ASA First 22. Corsair has brought out a 20 foot (6 meter) day-sailing trimaran, the Pulse 600. If you want to go fast, as fast as anything on the river or bay, but do it more sedately than hanging from a trapeze or foiling, this would seem to be a good option. Again, like the Beneteau ASA, the Pulse 600 has a nice long cockpit to accommodate all your friends. More info at the Corsair website. The RS Quest is their model for a main/jib dinghy trainer. 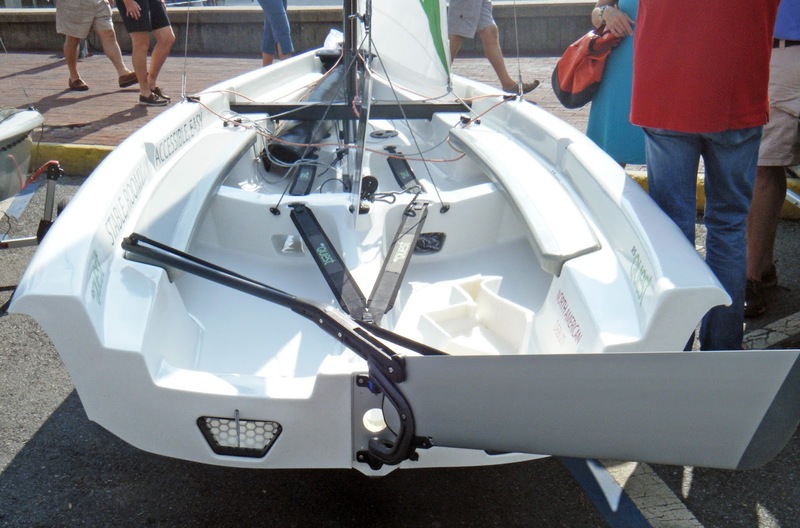 The 14' (4.3 meter) roto-molded Quest dinghy with assymetric was designed using the requirements of the British Sea Cadets. 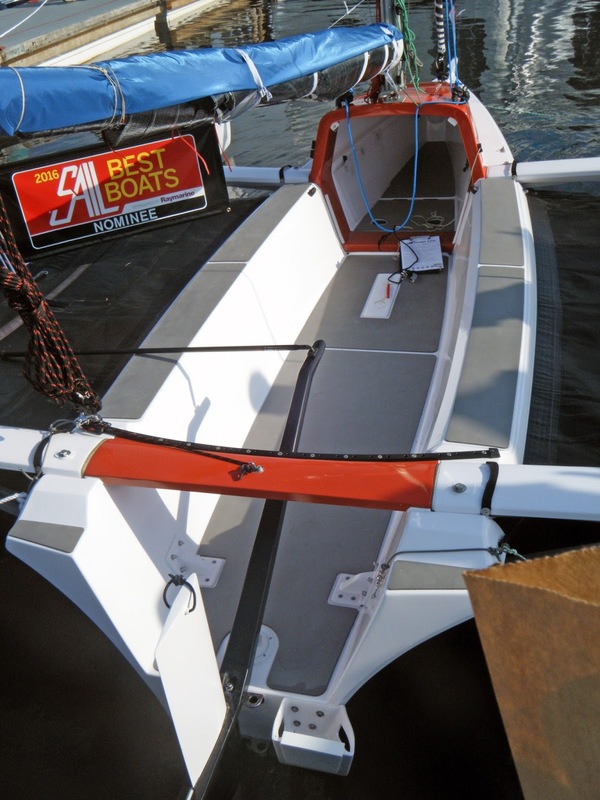 Most modern roto-molded hulls use chines, or in this case a stepped spray chine to provide stiffening to the hull. It really is amazing how complicated a dinghy interior they are able to manufacture in roto-molded construction nowadays. 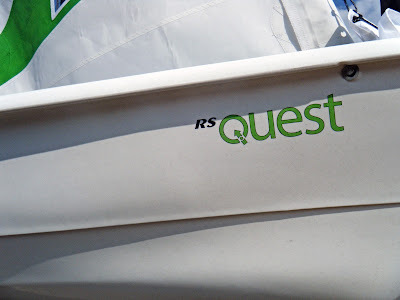 I wonder if these companies have a dedicated roto-molding engineer to successfully put together a dinghy such as the RS Quest. To take the stresses off the plastic hull, RS has put the mast of the Quest onto an aluminum mast thwart (shades of the pre-WWII Uffa 14's!). More information on the RS Quest here. The Seascape 18 joins a long list of those mini-sport boats, the one's that measure plus/minus 20' in length (the Open 5.7 and the Viper VX One are two that come immediately to mind). This one is built in Poland and the VOR influence is definitely seen in the very wide stern and double rudders. Information on the Seascape 18 over here. A step up from a bean bag chair, I like the idea of a couple of soft chairs thrown around the Seascape 18's wide cockpit floor for post-race socializing. The Torqueedo E-outboard was also a nice touch.